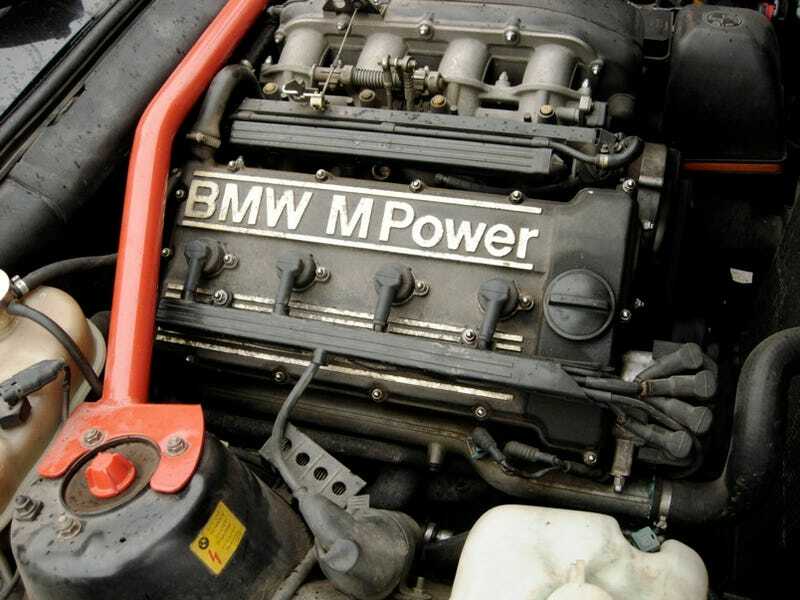 M Power usually comes in a greater number of cylinders: six in an E46 M3, eight in the current M3, ten in an M5 and twelve in the McLaren F1. But this little four-pot—and you guessed S14B23 if you guessed right—is what powered the original E30 M3, that Lego block of automotive perfection able to give grown men the wobblies in the knees and the sighs on eBay. The S14B23 has got quite a pedigree. The engine block is the M10, which has scaled in horsepower from 75 in the 1962 BMW 1500 sedan all the way to around 1500 in Gordon Murray’s sublime Brabham BT52, which gave Nelson Piquet the Formula One world title in 1983. The cylinder head is straight off the M88 engine from the M1 supercar, minus two cylinders. In the E30 M3, the engine is 2.3 liters (93.4 mm bore × 84 mm stroke), naturally aspirated like every proper M and develops in the close neighborhood of 200 HP. Not bad at all for an unblown street engine in 1986. But transcending all the numbers is the sheer ferocity of noise as the S14B23 approaches its readline of 7200 RPM. If you care—and are surrounded by noises less pleasant—you might as well hit play and listen to the sixteen valves of the very engine pictured here do their magic around a racetrack.